Material: Plastic. - Help reduce waste, easy to use. We will do our best to help you to resolve your problems. We will try our best to reduce the risk of the custom duties. We would try our best to help you solving any problem. Others Rate of item arrived 1% 3% 20% 35% 30% 11%. Brazil Rate of item arrived 1% 4% 20% 40% 25% 10%. Russia Rate of item arrived 1% 5% 25% 35% 26% 8%. Spain Rate of item arrived 2% 15% 25% 35% 20% 3%. Great for protecting your toothbrush head, keep it tidy and clean. All the toothbrush covers are made of food grade PP material. Package included:5pcs toothbrush head covers. Easy to use tube squeezer for all toothpaste, tube cream, tube gel,make-up, paint, etc. 1PC x Toothpaste Squeezer. Also note that monitor settings may vary from computer to computer and may distort actual colors. 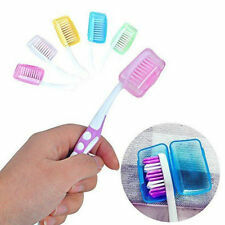 1Pc x Toothbrush Spinbrush Suction Holder. Can simultaneously hold five toothbrushes! Also note that monitor settings may vary from computer to computer and may distort actual colors. We believe that everything could be solved by communication. 304 stainless steel materials. Healthy anti-corrosion and easy to clean. Material: 304 stainless steel. Wall suction. Most of the walls can be adsorbed. No Have a punch, do not hurt the wall. Inclusion Program:1 xToothbrush Holder. 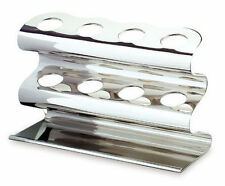 Folder mouth wide 6.5CM,Suitable for the squeeze is less than the width of the product 6.5CM. Rate (item arrived). United Kingdom. Great for protecting your toothbrush head, keep it tidy and clean. Package Included:1 x 5pcs toothbrush head covers. Ideal for traveling, hiking, camping use. Keep your toothbrushes clean. Automatically dispense a certain amount of toothpaste (around 1 gram), and use up the last drop of toothpaste. To achieve one-touch automatic squeeze toothpaste. The automatic toothpaste dispenser without any electrical power. 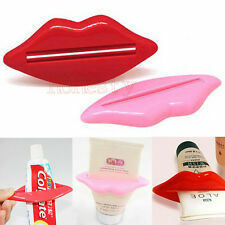 5PCS Traveling Hiking Toothbrush Head Holder Case Box Protective Cover Shell Cap. Package Included:1 x 5pcs toothbrush head covers. Great for protecting your toothbrush head, keep it tidy and clean. 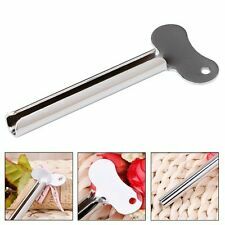 Easy to use tube squeezer for all toothpaste, facial foam, tube cream, tube gel. 1 x Tube Squeezer Bathroom Toothpaste. Apply 6.5cm width of toothpaste. Strong suction cup to prevent slipping. Holds 1 razor. Also note that monitor settings may vary from computer to computer and may distort actual colors. Lift, push and lock feature for secure adhesion to smooth surfaces. Specifications Material:Plastic Color:Send Random Size: Approx. 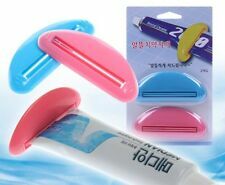 7.5cm*2.4*8cm/2.95"*0.94"*3.15" Package Includes: 1pcs Rolling Toothpaste Dispenser (Color random). Item:Toothpaste Squeezer Dispenser. 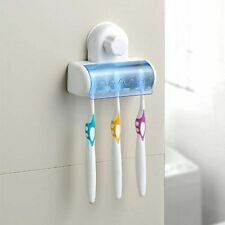 1 Toothpaste Squeezer Dispenser. This unique automatic toothpaste dispenser adopts vacuum technology, pump out last drop of toothpaste and avoid direct touch, stay economical, hygienic and convenience. A typical bathroom has at least one toothbrush or electric toothbrush as well as a tube of toothpaste. These items can easily make your bath counters feel crowded, and placing these items directly on the counter is not ideally hygienic. Investing in a toothbrush to use in your bathroom is a wonderful idea, but you must first decide what type of toothbrush holder to buy. 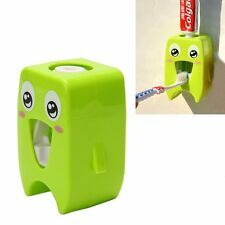 What are some of the styles of toothbrush holders available? Before you buy a new toothbrush holder to use in your bathroom, you need to explore the various types of holders available for your toothbrush. 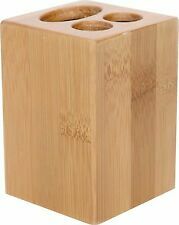 A toothbrush holder may be made out of glass, plastic, wood, metal and other materials. Some of these toothbrush holders for a toothbrush or an electric toothbrush have space for more brushes and for a tube of toothpaste, but other toothbrush holders only have space for one or two toothbrushes. While you want to find a material and style of toothbrush holder or electric toothbrush holder that will look great with the décor in your bathroom, you should also think about the cleaning and maintenance requirements. For example, you may develop a white residue underneath your toothbrush, and some stand materials, like plastic, may be easier to clean in your bath than others. What material is well-suited to use as a holder for a toothbrush? When buying a brush stand for your bathroom objects, you should analyze the look and material of the toothbrush holder carefully. Glass or ceramics in white or other colours are popular because of the decorative properties, but these materials can easily shatter if they are accidently knocked onto a hard bathroom floor. Wood is also popular in a bath and may not shatter, but this material used as a stand for your toothbrush may not hold up well because of the regular moisture associated with the toothbrushes. Plastic is a great option to consider if you are looking for durability and easy maintenance in a toothbrush holder for your bathroom. Do you need a special electric toothbrush holder? Regardless of the type of toothbrush holder that you buy, you should consider the special needs for an electric toothbrush holder if you have an electric toothbrush or another type of large brush. 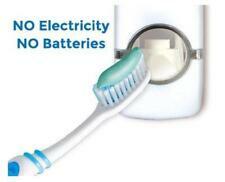 An electric toothbrush is larger or bulkier, and it may also be heavier. Getting a special electric toothbrush holder that has the right design for your bath area and enough space to accommodate the larger size of your brush and even a tube of toothpaste is critical. Are any toothbrush holders ideal for small bathrooms with limited counter space? You may desire a white plastic holder, a blue ceramic holder or something else, but your options may be limited if you do not have space on your counter for a stand for your toothbrush and toothpaste. If you have a rather small bathroom with limited counter space, consider a mounted holder for your toothbrush. Some can be fastened to the bathroom wall with screws. 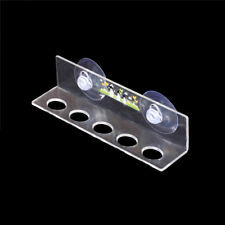 Others may use suction cups to stick to the bath wall or mirror. Consider the space you have available to mount the holder as well as the overall strength that you need the holder to have based on your toothbrush types.